A charming doctoring game with a questionable bedside manner. Wunderdoktor's beautiful handmade world is a delight to travel through, but beneath that charming exterior lies a twitchy, unforgiving, and sometimes unrewarding puzzle game. What is it? A point-and-click adventure that tasks you with healing a procession of patients in a tongue-in-cheek, medieval fantasy world. It isn't easy being a medicine man in an era before antiseptic and rubber gloves. You have to put your own safety on the back-burner and really get hands-on with your patients, using your bare mitts to squeeze horrible pimples, drag bugs out of open sores, and re-attach comically dangling eyeballs. 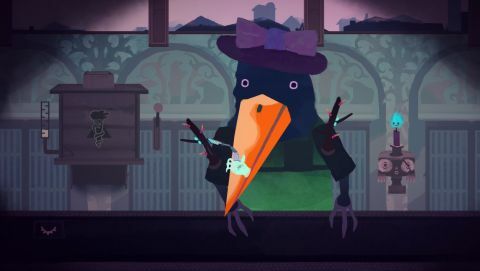 So goes the life of a medieval surgeon in Ghostbutter's Wunderdoktor, a charming point-and-click adventure that evokes Trauma Center, Samorost, and Papers, Please. ...you'll examine patients with a big magnifying glass, inject them with syringes, slap ghosts away with a flyswatter, sew shut open wounds, and use a circular saw to grind down crystalline growths. Here's the setup: you're a travelling healer, exploring several regions of a playfully gothic yet plague-infested fantasy world. But while the scenery changes outside your rickety doctor's wagon, you spend the entire game inside one examination room, seeing to a non-stop stream of ghoulish patients. One might be suffering from a nasty outbreak of clams, another might have prickly branches growing out of their shoulderblades, and meanwhile their neighbour has to put up with a pesky poltergeist. Later cases combine symptoms, giving you pestilence-ridden patients that need to be sawed down, clipped off, and stitched back together before the grateful creature can be sent on their merry way. It's a pleasingly tactile game, giving you a variety of tools to perform your healing arts with. Using the mouse cursor exclusively, you'll examine patients with a big magnifying glass, inject them with syringes, slap ghosts away with a flyswatter, sew shut open wounds, and use a circular saw to grind down crystalline growths. The cursor changes depending upon the action required of you, so there's no thought required as to which item should be used for which lightly gruesome medical procedure. You can simply enjoy getting down to work, with the delightfully squishy sound effects providing a satisfying amount of feedback. However, it's the fantastic papercraft artwork that does most of the heavy lifting when it comes to Wunderdoktor's cheerily macabre atmosphere. This is the surreal, storybook horror of The Melancholy Death of Oyster Boy by Tim Burton, but with an even gentler nature than that morbid picture book. There's no real gore, no bad language, and no one dies unless you stuff up your operations. Wunderdoktor is eventually revealed to be unforgiving of mistakes. Speaking of which, each patient comes with a life bar—represented by a dwindling candle—and if you take too long, they'll keel over dead. At which point your cute little assistant Stein will revert time to before the consultation, and you'll have to keep prodding at the patient's body until you succeed. This isn't so punishing during the game's early stages, where the list of ailments is short and your interactions with them are basic, but Wunderdoktor is eventually revealed to be unforgiving of mistakes. The most egregious might be the music puzzles, which require you to match a short sequence of notes chirped by your little sidekick by hammering on your patient’s teeth or nostrils. The problem? None of the notes, or the toothy keys, are visually marked in any way, so you either need a great ear for music or enough time to trial-and-error your way through these aggravating sequences. Needless to say, I’m blaming them for many of my patients’ deaths. There are also certain treatments that require twitchy, precision mouse movements: swarms of fast-moving mosquitoes you have to click on, sometimes repeatedly, or how about the strobing berry pimples that can only be safely squashed when they turn from pink to blue? The former are maddening, but even the berries can be a nightmare when you're also dealing with a nervous, twitching patient, a meddling poltergeist dropping harmful slugs everywhere, and plasters that just won't stay stuck. There is an attempt made to help struggling players through the more ruthless moments—fail a consultation a couple of times and glowing blue bugs may appear during your next attempt at the operation, bugs that will restore a portion of the patient's life bar when touched. Unfortunately, in many cases this help was offered way too late, and the patient would croak before I could grab the first healing bug. There were only a few of these difficulty spikes leading up to the fifth and final act, but it ends with a boss rush of sorts against a series of tough patients with increasingly tiny life bars. Others may fare better, but my wrist was complaining loudly as I tried to squash every last mosquito, locate each hidden bug, saw away each cankerous crystal, and then deliver the correct medicine tablet before their candle burned away to nothing. Quit in the middle of this sequence, like I did, and you'll have to start the entire boss rush again. Difficulty is very much a subjective thing of course, but when overcoming a troublesome patient I didn’t feel that emboldening sense of triumph I’d get from polishing off a Dark Souls boss, or solving a tricky puzzle in The Witness. More often than not, I’d be swearing at the screen. The time limits feel too stingy in the later chapters, but I’m not sure that simply extending them would solve my underlying issue. Chasing miniscule hitboxes (in the case of those mosquitoes) across the screen is not my idea of a good time, particularly if, like me, you suffer from repetitive wrist strain. And yet, I find it very hard to summon any real malice towards Wunderdoktor, which is one of the most inventive games released this year. That's partly down to the artwork, which imbues every one of its cast with a grimy, quirky charm, but it's also due to the adept comic writing. Ghostbutter's game is not overburdened with prose, but the patient descriptions and dialogue made me smile pretty consistently—how could you not when you're greeted by the overexcitable Danil Babok, a 'Town Amuser' with an aubergine for a head? There's also backstory and sketchy artwork to collect, in the form of note fragments sporadically churned out by your furnace once you've disposed of enough medical waste, so if you enjoy your first time through this decidedly linear adventure, there's a solid reason to revisit it. Wunderdoktor's myriad charms can only go so far, however, and beneath its storybook surface lies a merciless game of medieval doctoring that occasionally reminds you how miserable such a profession must have been. Thank god for antibiotics, antiseptic, and—above all—rubber gloves.